5 years ago the thought of Betty Blocks working with Microsoft would’ve made our CEO Chris burst out laughing. Betty Blocks was a counter voice against everything Microsoft stood for. All things Microsoft weren't allowed in the building (leave your Windows laptop at the door please), and saying ‘Microsoft’ was like saying ‘Voldemort’ in Harry Potter: you simply didn’t. But, since Chris and his brother Tim started their entrepreneurial journey 17 years ago, a lot has changed at Microsoft. One of the big changes is that in 2014, Satya Nadella became the CEO of Microsoft and things changed for the better, rapidly. Under the leadership of Satya, Microsoft took its business into a new direction with open arms, taking a vulnerable position along with it. They became open to the community and started embracing new possibilities from other companies. Nowadays the vision of Microsoft is to facilitate innovation by investing in new ideas, especially by catering more to the start-up and scale-up market. It used to be ‘Windows first’, but now it’s ‘Windows and’. When looking into the way Microsoft does things nowadays, it was clear our old assumptions weren’t aligned with reality anymore. We’re all about change, and when we need to change the way we see things, we’re happy to do so :). But, the real test is where the rubber meets the road. Especially when you have our developer tag-team Johpie and Johpie in the driver’s seat. When our developer tag team Johpie and Johpie worked on the migration of Betty Blocks to Azure, every tiny spot of doubt was dealt with quick. After a long weekend, they both came in and said “Holy shhh, Microsoft became awesome, we love the Azure platform!’ Make no mistake, getting the approval from Johpie and Johpie is not an easy thing, so this was big. That both organizations love each other's platforms is an amazing thing, but to really make a partnership great, you need the same northern star. The vision of Betty Blocks is simple: We want to democratize application development and make it available for everyone. What this means is that in 2023 everyone can build an application. At Betty Blocks we believe that citizen development will be the future of application development. That’s a big hairy audacious goal, but we are positive we will make it happen – especially with the new partnership and shared vision. But what does this mean for organizations interested in the new features the partnership brings? With the Betty Blocks platform hosted on Microsoft Azure, organizations now have the ability to scale on the Betty Blocks platform with their Azure subscription. This gives them better flexibility, agility, security, and overall way more possibilities. 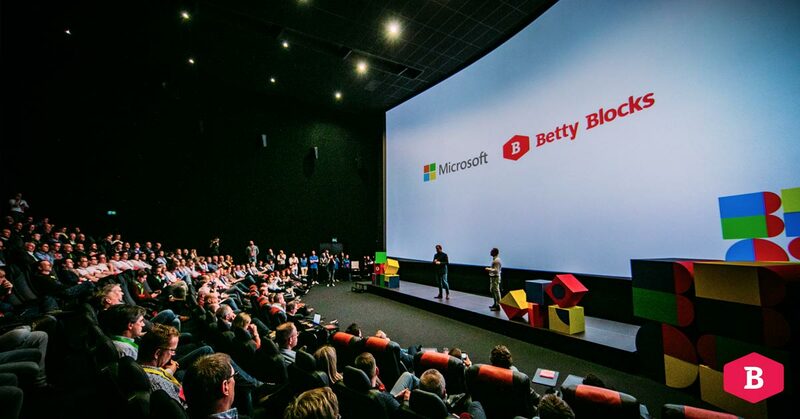 With the foundation of Microsoft and the innovative possibilities of Betty Blocks, customers now have more options for their applications. This way they can get custom-made applications that fit 100% with their needs even easier and faster. There’s a lot in progress for the future of the partnership and while things are still at an early stage, we are excited about the support we can bring in the near future.